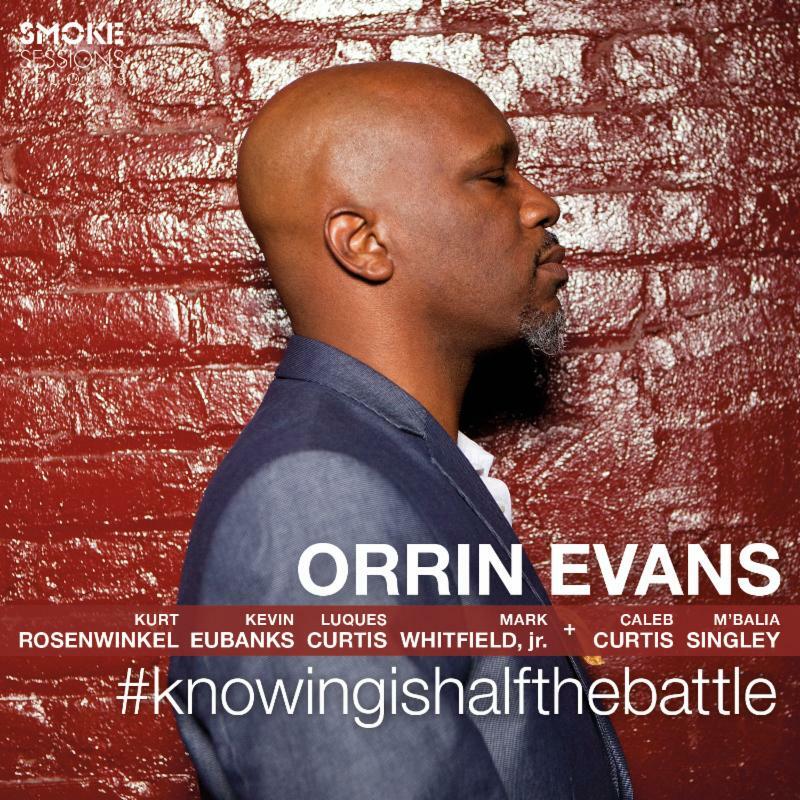 Pianist/composer Orrin Evans has parroted that line for decades, but says he’s only recently come to realize what it truly means. On Knowing Is Half The Battle, his third release for Smoke Sessions Records, Evans shares his own lessons in life and music on a raw, electrifying session that teams him with a pair of renowned guitarists who are also, not coincidentally, native sons of Evans’ own hometown of Philadelphia: Kevin Eubanks and Kurt Rosenwinkel. He’s also joined by the latest in a long line of inspired rhythm sections, bassist Luques Curtis and drummer Mark Whitfield, Jr., along with up-and-coming saxophonist Caleb Wheeler Curtis and a longtime collaborator, vocalist M’Balia. 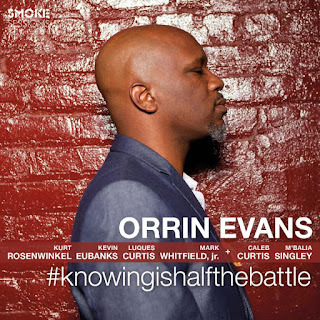 #knowingishalfthebattle shows Evans coming to terms with what he’s learned over his years on and off the bandstand — and more importantly, how to make use of that knowledge. In large part, the answer he’s come to involves letting go, forgetting what’s been learned and trusting the instincts that come along with it. By inviting such virtuosic musicians into his world, he’s asking them to do the same and making new discoveries through a collective act of forgetting. That kind of edge-walking spontaneity is familiar to anyone who’s ever seen Evans perform live, but it truly shines through on this recording, which is invigorated by its thrilling sense of looseness and in-the-moment invention. The “anything could happen” vibe draws visceral performances from the full ensemble, but especially from the two six-string wizards that join in for the session. Rosenwinkel is one of the most revered and influential guitarists of his generation; Eubanks gained fame for his 15-year stint as the bandleader for The Tonight Show with Jay Leno, but is also well respected for his work with jazz greats from Art Blakey to Dave Holland to Steve Coleman. The latter evokes Evans’ upbringing in the Church of God in Christ, which began every service with a call to worship. Though not intended that way by the composer, Evans uses the piece for a similar purpose, his spirited singing of the melody gradually gathering the musicians to express themselves. The church is one place where Evans garnered the knowledge that he brings to bear in his music today. The album also pays homage to some of the most influential people in his life, starting with his father, playwright Donald Evans; one characteristically direct and pointed piece of advice from the elder Evans gave “You Don’t Need a License To Drive” its title. Eubanks’ blistering solo is followed by the pianist’s own trenchant turn and a concise but eloquent statement by Curtis, before Evans and Eubanks reenter with a disruptive outburst. Evans draws material from a wide variety of sources: “When Jen Came In,” which he originally recorded on his 1995 debut Déjà Vu, was penned by a college classmate, while the bluesy “Slife” was written by bassist and videographer Jason Fifield, who tirelessly documents the Philly jazz scene. “Kooks” is a David Bowie classic, first performed by Evans’ Captain Black Big Band on the night that the legendary rock icon passed away, while “That’s All” is a Songbook standard; both feature the unique vocal stylings of M’Balia, whose work with Evans dates back to his neo-soul group Luv Park. “Zeni Bea” is named for the two month-old daughter of Luques Curtis, who makes her recording debut on the track, crying as the assembled artists chant her name. Parenthood is another theme of the album (and another source of/drain on knowledge). It’s book-ended by a pair of tracks produced by Evans’ youngest son, Matthew, who chops and manipulates a solo piano improvisation to create an electronic portrait of his father and their relationship that places the concept of passing down knowledge in a surprising context. So now you know — and… well, you know the rest. “#knowingishalfthebattle” was recorded live in New York at Sear Sound’s Studio C on a Sear-Avalon custom console at 96KHz/24bit and mixed to ½” analog tape using a Studer mastering deck. Available in audiophile HD format.